The people have spoken. 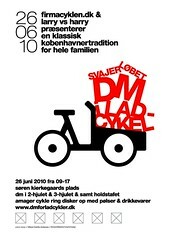 When I asked about which design you all prefered for the poster for the upcoming Svajerløb - Danish Cargo Bike Championships - a while back, you were very clear. The internet is, at times, a cosy place bubbling with a collaborative, creative spirit. I had posted the three rough designs and was thrilled to recieve an email from one of our readers, Richard Melcher. He loved the design and offered to help out, being a graphic designer. The result is seen in this blogpost. We collaborated on finishing and polishing. Thanks so much for a fruitful, creative collaboration, Rich! ANYWAY... 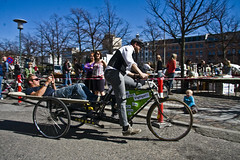 This blogpost is the announcement of the 2010 Svajerløb - or Danish Cargo Bike Championships to be held on June 26, 2010. Presented by Firmacyklen.dk & Larry vs Harry. It's on the Saturday after the Velo-City Global conference wraps up here in Copenhagen. I've had many emails from readers who are attending the conference and who have said they're hanging out for a couple of days, so I've been sure to tell them to start forming some cargo bike teams for race day. There will be various disciplines. Two-wheeled cargo bike race [Men and Women], three-wheeled cargo bike race [Men and Women] and the always popular Team Relay. Especially this last discipline will be perfect for some international teams! Let's see what you GOT! All the races are the same format as they have been for the better part of a century. One lap with an empty cargo bike and then into the pits. 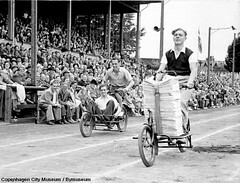 Each participant has to load up their bike with two car tires and a bundle of newspapers before shooting off for the final lap. It costs 50 kroner [$10] per race you enter and all the entry fees go directly to prizes. 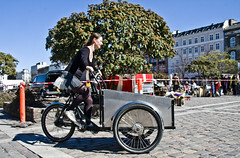 You'll need a cargo bike to take part, but Baisikeli has some for rent if you can't borrow one. The last svajerløb was held in 1960, until Firmacyklen.dk and Larry vs Harry re-launched it last year. We're hoping to make the races stick. 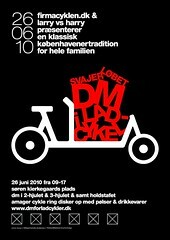 It's a fantastic, timeless tradition that celebrates the integral role of the cargo bike in Danish history. Team relay in a tutu and on a Christiania bike or, on the right, an ambulance bike. Old school and new school. The photo on the right was from the races last year. The website for the races is now up and running, with an English version as well, so if you're in Copenhagen be sure to enter or, at the very least, show up on the day for cheer for the participants. 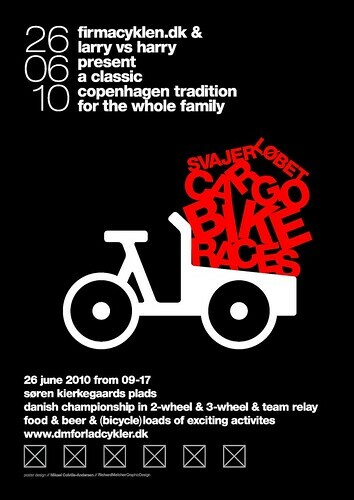 The brilliant people from the bike club Amager Cykel Ring will be selling sausages and cold drinks and there will be beer on sale from Ørsteds Beer Bar. - Register to take part online and sign up for newsletter. - Photos from last year's race. - Film about last year's race. 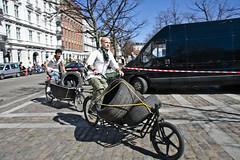 - Copenhagenize's coverage of last year's race.